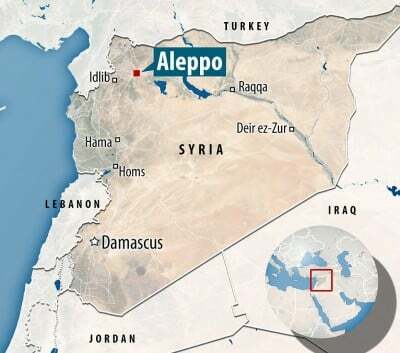 Russia’s official news agency TASS has confirmed that Russian troops are taking positions along the Aleppo road – the main road leading into Aleppo from the north, which was captured by the Syrian army in July. Since the terms of the agreement are not being published, the precise nature of what was agreed was not clear from Kerry’s remarks. It is now becoming clearer. It appears from the TASS report that whilst Syrian troops are being withdrawn from the immediate area of the Castello road, their place is being taken by Russian troops – apparently naval infantry troops sent there from the Russian base at Khmeimim. This explains why, as reported previously, the Syrian air force dropped leaflets over Aleppo a few days ago giving the Jihadi fighters in eastern Aleppo two days to lay down their arms or evacuate. The Syrians were pre-empting the announcement of the US-Russian agreement, which it is now becoming clear requires the Jihadi fighters to evacuate eastern Aleppo, and which came into force on Monday i.e. two days after the leaflets were dropped. In passing, the incident with the leaflets confirms that the Russians were keeping the Syrians informed of the progress of the negotiations with Kerry, just as they say. Earlier reports which circulated a few weeks ago claimed that the Russians told Kerry that they wanted all Jihadi fighters out of eastern Aleppo by mid September. It is increasingly looking as if the US-Russian agreement does indeed contain such a provision, though possibly with a more relaxed deadline. The original US ceasefire proposal which the Russians rejected at the G20 summit in Hangzhou required the Syrian military to pull back from the Castello road at a time when the Jihadis led by Jabhat Al-Nusra were in control of the Ramousseh district and had therefore closed the Ramousseh road into Aleppo from the south. Though there are obviously more than 2 roads into Aleppo, the Castello road from the north and the Ramousseh road from the south are the two main roads into the city. Had the US ceasefire plan as originally conceived come into effect the Syrian army would have given up control of both of the two main roads into Aleppo: the Castello road from the north and the Ramousseh road from the south. That would have made the government’s position in Aleppo extremely precarious and vulnerable to any collapse of the ceasefire. The recent government victories in south west Aleppo have radically changed the picture. With the Syrian army back in control of the Ramousseh district its communications from the south are secure. If there ever was a plan by the hardliners in Washington to impose a ceasefire in Aleppo that would have made the city vulnerable to takeover by the Jihadis, then it has failed. Instead it appears that the existing plan is for the Jihadi fighters to be evacuated from eastern Aleppo instead, securing the government’s control over the city. Words of caution are in order. The mere fact that the Russians are taking control of the Castello road in place of the Syrian army and that the US – Russian agreement apparently requires the Jihadi fighters in eastern Aleppo to evacuate the city does not mean that the latter will happen. Already there are reports that various Jihadi groups are rejecting the agreement Kerry and Lavrov agreed in Geneva on Sunday. It seems far more likely and far more in character that the Jihadi fighters in eastern Aleppo will dig in rather than evacuate. The US – Russian agreement does not therefore mean that the battle of Aleppo is over. What it means is that a faction in Washington – which however does not mean the entire bureaucracy in Washington – has now rather grudgingly coming round to accepting the fact that the battle is lost. In order to save something from the wreckage it is therefore trying to save the lives of the Jihadi fighters in eastern Aleppo and to preserve them as a coherent force by agreeing face-saving terms for their withdrawal. The fact the Jihadi fighters will not appreciate the effort and will almost certainly refuse to do what the US has agreed for them is another matter.